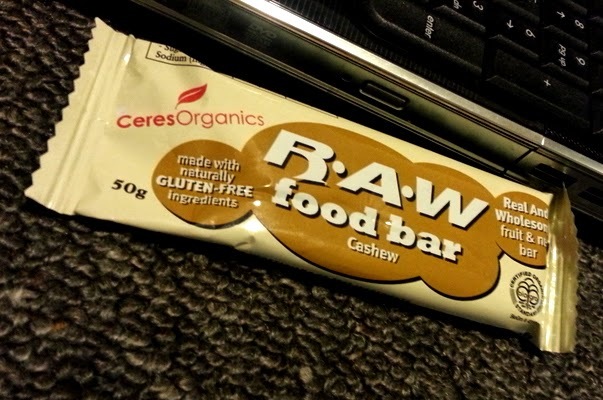 I've seen these R.A.W food bars around a bit, but never tried one. I got one the other day from the supermarket since it was on special. Ingredients: Cashews (50%), dates. - Pretty raw ingredients! While obviously high is fat and sugar, both ingredients are natural so it's still a good option for a treat (over a regular bar anyway). Taste: Pretty good, it is quite small (50g) for the amount of calories, but it keeps you satisfied if you're looking for something small and sweet in the afternoon! The flavour isn't anything amazing, just a slight cashew taste. So I wouldn't bother if you don't like cahews. Price: What you expect for a health bar. Around $3.00, sometimes cheaper if it's on special. I would buy this again for a good raw snack, I just wish it had more flavour.